With a brightly colored magical balloon as BIG as her imagination, Maria and her cute little doggie float up to travel high above the clouds and across the skies! She visits other girls to sing songs in Spanish and have lots of fun as she sparkles up the day with colorful ribbons, confetti, chocolates wrapped in gold and lots of JOY! Maria finds that her dreamy travels can be lonely. But love for her family leads her all the way back home – with a marching band, piñatas and a big, HAPPY parade -- just for her! Betty K. Bynum is an actress, writer, singer / songwriter and entrepreneur. 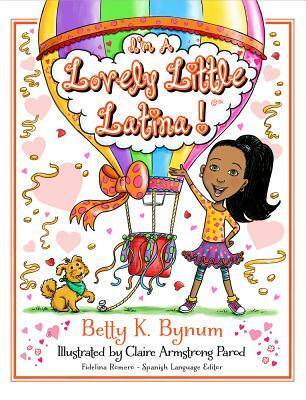 She wrote I'M A PRETTY LITTLE BLACK GIRL, and has 3 more books ready: I'M A LOVELY LITTLE LATINA (Fall '15); HOORAY! I'M A GIRL IN THE USA! (Spring '16); I'M AN AWESOME ASIAN GIRL (Fall '16) in a planned 12 book series. She created apparel for girls and is currently working on a line of Madame Alexander dolls based on the lead characters in each book title of the series.